There are times when I consider myself the luckiest accident-prone person. In all my travels overseas, I’ve never had any major accidents or incidents (yet) considering how I flirt with danger sometimes. I just like to hop on a good adventure whenever I get the chance, and I try not to let the fear of possibly getting into an accident or injury get in the way of fun. And for some serendipitous reason, something always occurs whenever I’m about to travel overseas. Take that photo above for example, I call it a double whammy. I got into a dragon boat accident which slashed the skin off the back of my thigh. 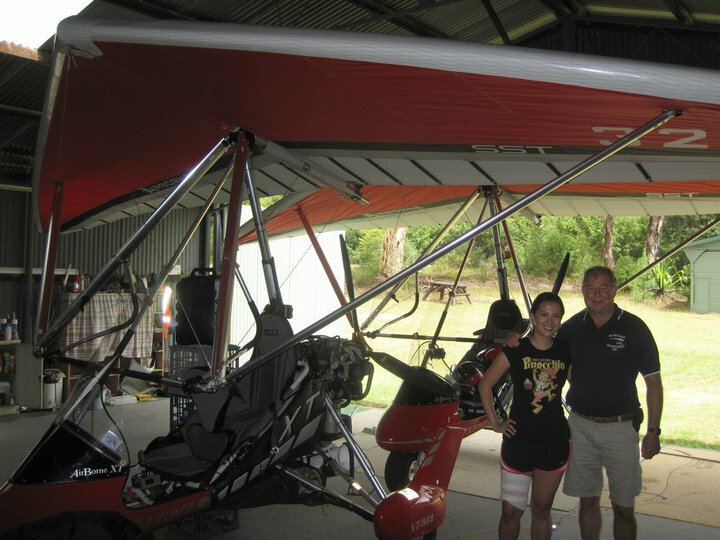 The next day, I flew a microlight (previously scheduled), and a few weeks after, flew to Los Angeles and Mexico. Well not to mention that as I type this, I’m wearing a moon boot on my left leg from last weekend’s incident, and here I am also getting ready to leave overseas in 12 hours. And this has now got me thinking of the top adventurous things we ever got to. 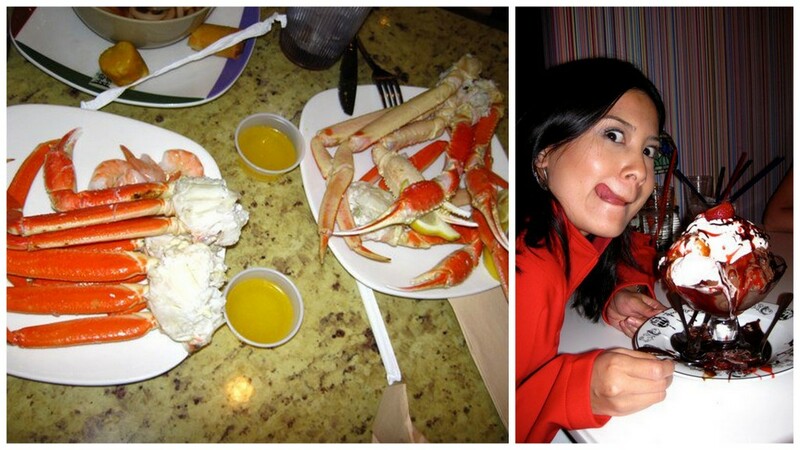 While most people spend endless hours in casinos and shows, I spent an enormously, unhealthy amount of time in the eat-all-you-can alaskan crab legs table. Followed of course, by a huge serving of dessert in Serendipity Cafe. I figured, while in the US, eat all the delicious bad food as we normally eat clean (or try to) in Australia anyway. Do you want to know what happened right after this food fest? The back of my neck started to throb. My joints (elbows and shoulders) felt like they were petrified. I couldn’t move them at all. The pain was so bad that I stayed at the hotel room the rest of our time in Vegas. I was so scared because you do not want this kind of thing happening in the United States , where you must have medical insurance should things go wrong. Yes, I deserved being reprimanded and after 24 hours, the pain went away (when toxins have been flushed out of my system) and I never went back to eating that way again! One of my most memorable underwater adventures were in Bora-Bora where we swam in the open water with black tip sharks. They may be reef sharks, but you must know how to behave around sharks. I admire them from a safe distance, pretending to be uninterested but deep inside full of marvel at these magnificent creatures. One guy from a different boat tour though, was too eager for his own safety. While the sharks act very apathetic around you, they do want a safe distance. This guy pulled the tail of one of the sharks and the shark’s reaction was to quickly turn and bite. He managed to quickly pull his hand away but not without the shark’s teeth grazing his fingers. The thought of this still makes me shudder! We also recently went scuba diving in the Maldives, and encountered a tiger shark. Our group kind of froze. Tiger sharks are one of the “Big Three” – top 3 dangerous shark species (1st is White, 2nd Tiger, then 3rd Bull sharks). However it just swam past us. It was hard to miss that shark , being close to 3 metres long. What made this activity extra dangerous was the fact that I was nursing a cold while doing this. I think I was loaded with Sudafed that I was feeling both drowsy and exhilarated — if that is at all possible! Ice climbing isn’t as easy as it looks (or sounds). I initially thought it would be just like rock climbing. It’s far from that! 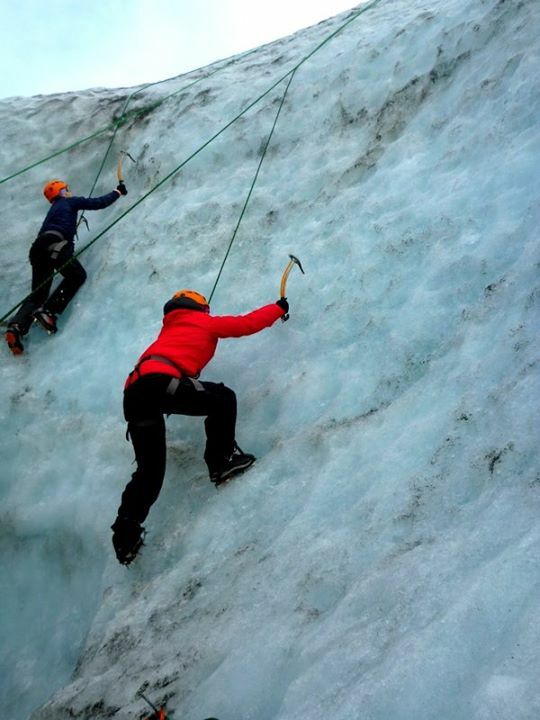 You need to have both coordination and strength – your arms need to be strong enough to aim for, and stab at the ice using an ice axe. This stab must be deep and stable enough for you to either hoist or carry your body weight upwards, while the feet , using the crampons, need to find a deep enough traction in the ice to climb. I didn’t postpone this because we had activities planned out back to back on a full itinerary, and postponing will have a domino effect on all others. I thoroughly enjoyed the experience, and while no incidents happened at all, I wouldn’t suggest pushing through an adventure activity when you are unwell. I have to say that among all the close calls we’ve had, this was when I really started to fear for our safety. We were visiting Caramoan, one of the most beautiful waters you could ever free-dive in. Unfortunately, this area is also known for its unstable weather. We reached the end of our trip and were heading back to Manila. This required a 2 hour boat ride from the island we were staying at to the airport. In the middle of the ride, heavy storm kicked in and the rickety wooden boat we were at hit a rock. We were stranded for a good 40 minutes. The scary part was when another wooden boat tried to “rescue” us. 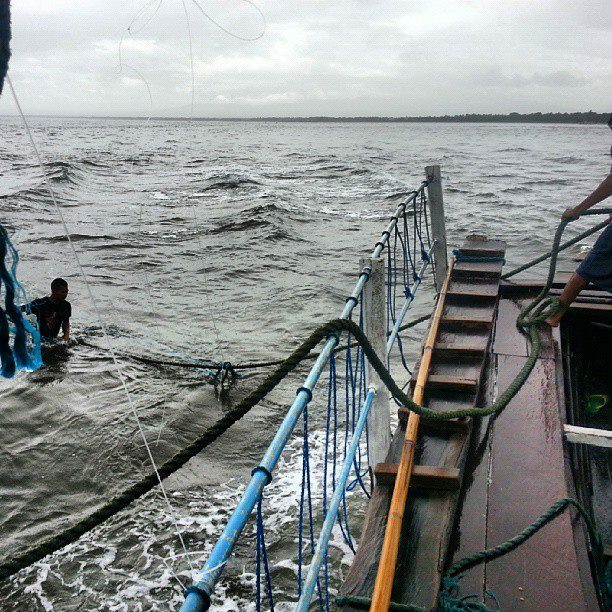 A rope was tied between the two boats, and the other boat pulled us in a wrong angle and we almost tipped over. We eventually made it to the airport but this incident has definitely left me shaken and I’m now more stringent about the safety standards of whatever mode of transport we get into when travelling. Many are surprised that we haven’t really had any major incidents while on the road. Knock on wood : no broken bones, stolen or missing bags, food poisoning, etc. 1.) Be adventurous, with a dash of caution. Before I engage in any physical activity that requires me to sign a waiver saying the company is not responsible for my injury or death, I thoroughly do my research before departing the country. I need to know the reputation of the company and read previous reviews and articles on the company and brand. I also take into consideration the safety standards of the country I will be undertaking the said activity in. I know that accidents can happen anywhere, but as an example, I would be very open to going on a cross country drive in the USA, but would probably think 3-5 times about doing the same in a country with civil unrest. This is the least you can do to make your life of adventure as easy as possible. I’ve accepted that choosing to do adventures may yield a greater exposure to injuries and harm. But the fitter you are, the lesser chances of an accident, and to those who are accident-prone like me: the faster you can recover and bounce back to the next adventure! This is the most important among the three. You can be at the best of health and practice great caution, but without travel insurance, these are rendered useless. For our kind of travel lifestyle we get a year-round all-country covered insurance, similar to the World Multi Trip coverage of Southern Cross Travel Insurance. Because we travel quite often and sometimes cannot plan when or where we will be travelling within a space of 3-6 months (a lot of last minute travels come up too! ), a full coverage is what suits us. This means we are covered for 1 year starting from the first date of travel, to any country doing any activity , up to 90 consecutive days per trip. Travelling well prepared and well-covered ensures that I have peace of mind while overseas, therefore I can enjoy my trip even more! I’d love to know — what’s the most adventurous activity you’ve done while travelling? And how do you stay safe while overseas? Thank you for your comment and the interesting share about your eating background. I’ve been watching some of your recipes to get ideas on clean eating, they are very helpful. The hardest part for me is jumpstarting – but once you continue the healthy lifestyle for about 2 weeks, you will realise how good it makes you feel and then instead of thinking of it as a ‘sacrifice’, its more a way of life. A tiger shark!!!! A tiger shark!!! I’d have passed out. Enjoyed reading of your adventurous adventures and they make me feel like heading off tot he wilds. I think that realistically car crashes are the most dangerous thinsg ever, especially in countries with poor infrastructure. I remember feeling quite nervy at times in Ghana and in Kenya on some of the roads…. but at least I did have insurance and could have been medivacced out if I’d survived… luckily never had to do that. I am dreadful about travel insurance lately as most places I’ve gone are familiar enough… I keep meaning to get an annual one, at least for me…. must get a grip. Entertaining read! I hope your injury is starting to feel better. As an American, I find it sad that everybody has to worry about health insurance every time they come here. Great to hear that! Take care!